This tutorial was written by me on August 3, 2013. You will be changing raster layers 1 thru 10. 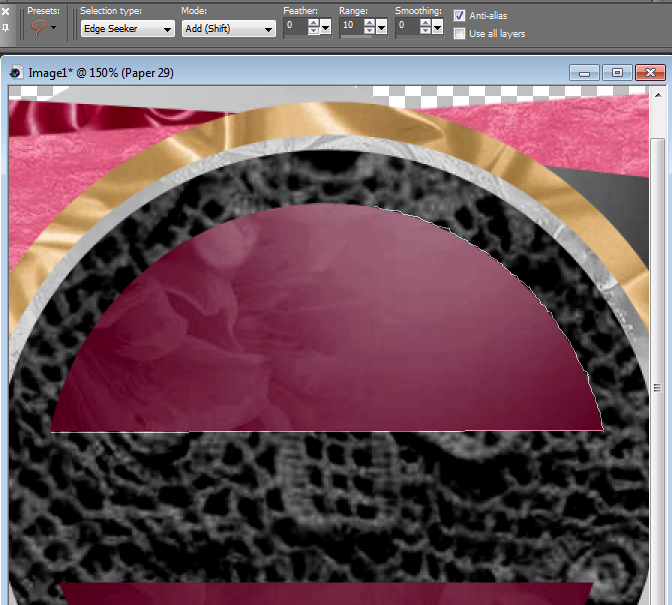 We will rename these paper layers to make this tutorial make sense. Highlight 1. Follow directions above. Use PP 28. Rename Paper 28a. Highlight 2. Same as above. Use PP 28. Rename Paper 28b. Highlight 3. Same as above. Use PP 14. Rename Paper 14. Highlight 4. Same as above. Use PP 25. Rename Paper 25. Highlight 7. Same as above. Use PP 11. Rename Paper 11. Highlight 8. Same as above. Use PP 9. Rename Paper 9. Highlight Paper 29 layer. Grab your FREEHAND SELECTION TOOL and using the same settings, try to stay as close to the edge as possible, start clicking along the edge till you get all the top part of that layer selected. Change BLEND MODE of copy of tube layer to HARD LIGHT and go to original tube layer and change BLEND MODE to SCREEN. Element 207 – C/P and move to bottom left corner. Element 135 – C/P and move to bottom left corner and on left side of element 207. Element 51 – C/P and re-size 50%. Move to bottom left corner in front of element 207. Element 48 – C/P and re-size 40%. Move to bottom left corner on the right side of element 51. Element 127 – C/P and re-size 30%. Move to bottom left corner in front of element 135. Element 36 – C/P and re-size 20%. Move to bottom left corner in front of element 48 and 51. Element 196 – C/P and re-size 40%. Move to bottom left corner in front of element 135. Element 199 – C/P and re-size 40%. Move to bottom left corner in front of element 135 and on left side of element 127. Copy and Paste PP 23 into Selection. Open element 155. 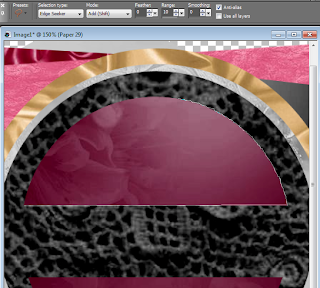 Add new raster layer and send to bottom. Flood fill with white. Go to LAYERS – NEW MASK LAYER – FROM IMAGE – SOURCE LUMINANCE CHECKED – INVERT MASK DATA CHECKED - CHOOSE Element 155 from the drop down menu – OK. If you are using the same tube as me, choose the colors you like, C/P the full tube move over to right side of tag and re-size 45%.